An interview with linguist and political analyst Noam Chomsky, the ongoing debate on net neutrality, the book of Kings, the Old Testament prophets, a Jewish rabbi with a whip and even the premise of the next Batman film, all seem to reveal a common theme—people cannot be trusted with power. Noam Chomsky, MIT linguist and public intellectual, is a soft-spoken person with hard-to-swallow but difficult-to-ignore views on western corporate media, US foreign policy and the general state of the world. During an interview with the BBC, he told the story behind the title of his book, Pirates and Emperors, inspired by a story in St. Augustine’s City of God. “Overwhelmingly, the United States since the second world war. Britain before that and concentrations of private power, which are enormous and tyrannical corporations closely linked to the powerful state; a network of concentrated power with international institutions like the IMF and so on, which are called, they sometimes call themselves the masters of the world,” he said. The internet has its own set of emperors who want to rewrite the rules of the internet, as they desperately try to fix something that is not broken. An outcry to #SaveTheInternet by comedy troupe AIB was answered by claims that the analogies used by them were imperfect and that net neutrality will not be threatened by the new rules. With a few days left before we hear about the future of the internet in India, it looks like telecom providers are going to play the long game—laying siege to the way the internet is used, for as long as it is necessary, until it is used the way they want it to be used. It should be no surprise that people with power have created a conversation that puts the interests of the masses at risk—something writ large in history as the general story of the world. 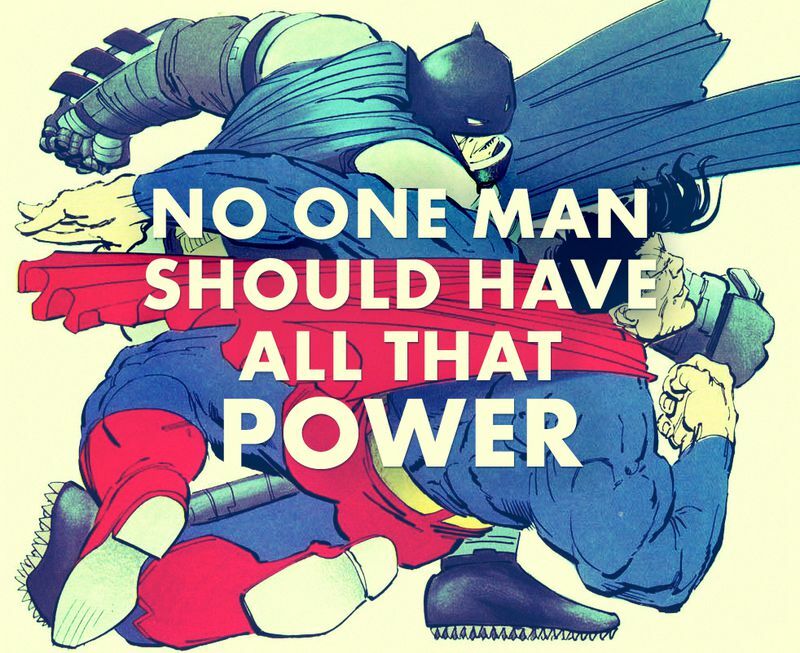 Even the trailer of Batman Vs Superman: Dawn of Justice names the use of power as the chief bone of contention between the two famous superheroes. No one man should have all that power. World and biblical history have one thing in common—it is a record of self-serving kings who have ruled the world with selfish ambition for selfish gain. In 1 & 2 Kings, all the kings of Israel are judged to be evil and only eight out of 20 monarchs in Judah are judged to be good. One after the other, each king leaves a legacy of evil and injustice, perpetuated and often worsened by his heir to the throne. In a different interview, Noam Chomsky points to a biblical precedent for abuse of power—identifying state policy with the country and its culture—that comes from the first book of Kings. “King Ahab condemns Elijah, who was seeking justice and freedom. He condemns him as being—a hebrew phrase ‘o-kher Is-rael’—it means roughly someone who hates Israel or troubles Israel, something like that. He’s anti-Israel because he is seeking justice and freedom. And that’s the origin of the concept and it has an inglorious history from King Ahab right through to the Soviet Union and up to today; and we should avoid it, at least if we want to identify ourselves with the ideals of Elijah and not King Ahab,” Chomsky says. Whenever I meet someone who tells me how religion inspires evil, I usually agree with them. But then I press them to see that the abuse of religion and power was not only condemned by the Old Testament prophets, it was anticipated by them. A famous episode in the Gospels tells the story of Jesus sitting at the temple, patiently putting together a whip of cords. It reveals that His anger was neither reactionary, nor reckless. It was planned and controlled; determined and fierce. Once he has finished making his weapon of choice, he proceeds to tear through the temple, driving out the money-changers, who had occupied a space reserved for people to pray and were exchanging currencies for the temple tax at exorbitant exchange rates. “You look over history, one after another form of coercion and control has been broken. The soviet system was collapsed from inside. Every system of tyranny we know about an impression has been people chip away at it, and it ultimately collapses. There’s nothing special about them,” says Noam Chomsky. The Gospel is good news because it reveals a new kind of King who gives people a new kind of weapon. Jesus reverses the use of power, making Himself subject to the power of death so He can draw people into a new kind of life—not by force, control or coercion but by a powerful demonstration of self-giving love. A healthy church reveals God’s rule in the hearts of people. It is a quiet resistance to the status quo, like a new whip of cords, quietly chipping away at the world’s love of power; inviting it slowly, steadily, deeply into the power of love. The oft-persecuted early church showcased this resistance by undermining a culture of aristocracy with the radical idea of equality. In his book, A Brief History of Thought, French atheist Luc Ferry credits Christianity with introducing three great ideas to the world—the intrinsic worth of human beings, the spirit of the law (as opposed to the letter of the law) and a common humanity based on the equal dignity of all human beings. “Christianity was to become the precursor of modern democracy. Although at times hostile to the Church, the French Revolution—and, to some extent, the 1789 Declaration of the Rights of Man—owes to Christianity an essential part of its egalitarian message. We see today how civilizations that have not experienced Christianity have great difficulties in fostering democratic regimes, because the notion of equality is not so deep-rooted,” he says. Humanity’s historical love of power is constantly undermined in Jesus by the power of love. It is our greatest command, Paul’s deepest value, and God’s greatest gift. Whether the battle over net neutrality is won by the rulers of the internet or its users, the Gospel is a declaration that a greater battle between unjust rulers and a loving King has already been won. Just as the cracking of the german Enigma code during the second world war was a turning point in the outcome of the war, the resurrection of Jesus proved to be a turning point in history, redirecting the course of humanity towards God’s ultimate victory and humanity’s greatest hour—the return of a righteous king.